An unidentified scientist with a golden eagle, the first golden eagle to be fitted with a tracking device in Yellowstone National Park, Wyo. 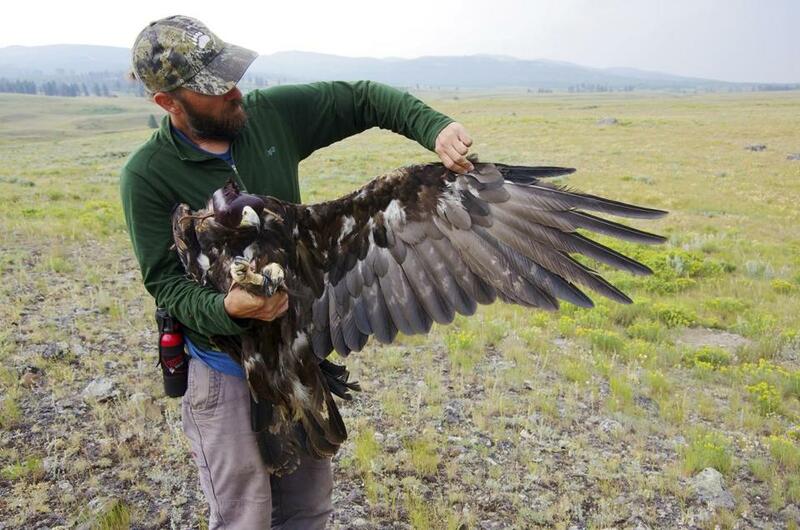 The death of the bird was a setback for golden eagle research in Yellowstone. Several other golden eagles at the park have been fitted with tracking devices. ‘‘It’s a little gut-wrenching because it’s so darn hard to trap and tag an eagle,’’ said eagle scientist Todd Katzner with the US Geological Survey in Boise. ‘‘A lot of it’s a matter of awareness and willingness of people to switch,’’ he said. Their numbers in the contiguous 48 US states are steady but they are vulnerable to collisions with vehicles and wind turbines, among other hazards. ‘‘This bird died right in the period we'd expect them to be wandering widely and searching for food,’’ Katzner said.